Illustrated. 651 pages. Wesleyan University Press. $40. 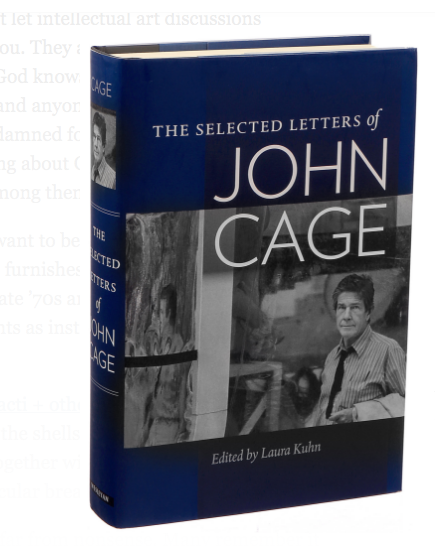 working on Cage's letters in Evanston in March 2015 was such an unique experience... which this book is bound to revive. I was aware that Laura Khun was preparing it (with Kenneth Silverman?) and worndering when it was going to come out. Cage studies are complex, it will take years before we shift from hagiographies to a more historical and sociological approach. This is what Silverman attempted with "Begin Again" a great book which was criticized for being too factual. There are a few letters out there that would really shed light on the fascinating mechanism behind the persona but also the dynamics of the times. I wonder for instance if Boulez' father's letter to Cage is included, as it challenges the late composer's public discourse about Cage, which would have been impossible to publish during his lifetime... anyway, very much looking forward to reading it.